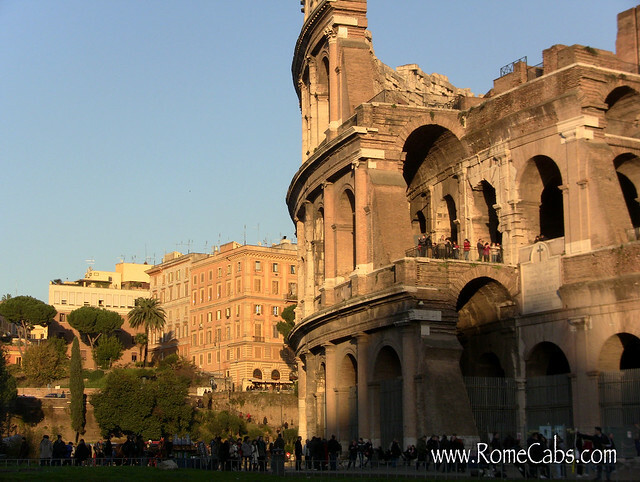 COLOSSEUMBuon giorno and welcome to Stefano’s RomeCabs, Rome’s leading company for private Airport and Civitavecchia Transfers, Shore Excursions from Italy’s main cruise ports, and Day Tours from Rome. Rome was not built in a day, but if you are short on time (such as a shore excursion from Civitavecchia) you can certainly see the highlights and enjoy the best that Rome has to offer in a day. We created a time tested itinerary for our most popular tour: Rome in A Day that includes, among others, the following famous monuments, museums, and squares. If you are looking for inspiration for some of Rome’s top sites that you can enjoy in a day, keep this list handy. The Colosseum is the iconic symbol of Rome and the once formidable Roman Empire. Originally named the Flavian Amphitheater after the family name of Emperor Vespasian who commissioned the elliptical amphitheater to be built in 72 AD, the Colosseum was primarily used for gladiatorial games, beast hunts, mock sea battles, theatrical displays, and unfortunate public executions. Purchase your Admission Tickets in advance to avoid long ticket lines. 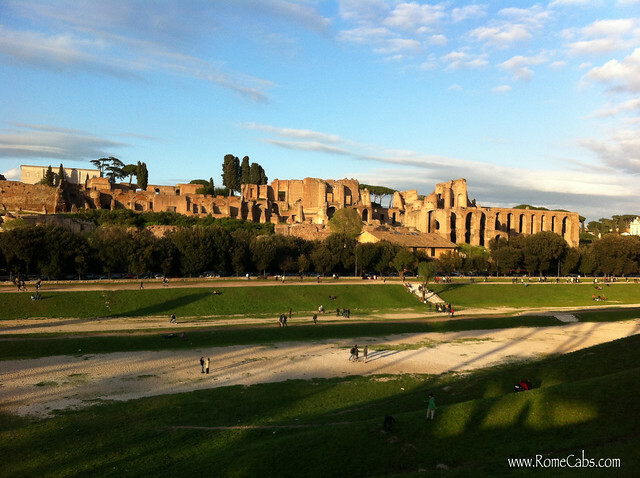 One of the wonders of Ancient Rome, Circus Maximus was Rome’s premier chariot racing stadium right below the palatial Palatine Hill where ancient Rome’s emperors and upper crust built their enormous villas – the Beverly Hills of Ancient Rome). The Pantheon is Rome’s ancient temple originally dedicated to all Roman gods (from which its name derives), and it was converted into a Christian Church in 609 AD. Having been converted into a church helped preserve this ancient monument from being stripped and quarried for building materials like other ancient monuments during the Medieval and Renaissance eras. The most formidable feature of the Pantheon is its imposing coffered dome with a hole in its center. This “oculus” (Latin for “eye”) was always open to nature’s elements allowing in sunshine, rain, and sometimes snow. The Trevi Fountain is the largest Baroque fountain in Rome with an amazing facade of Oceanus and his amazing seahorses jockeid by two Tritons. The Trevi Fountain was featured in the movie classics Three Coins in A Fountain and Federico Fellini’s famous “La Dolce Vita”. Legend has it that if you throw a coin into the fountain over your shoulder, it will ensure a return visit to Rome! It’s worth a try – and it’s for a good cause. The coins are collected each morning and donated to charity to help the poor. The 18th century elegant Spanish Steps unfurls to connect the Church of Trinita dei Monti and the Obelisk Sallustiano above, to the square below. At the base of this impressive stairway is a 1600’s Baroque fountain of a boat (Fontana della Barcaccio – “the Fountain of the Old Boat”) created by Pietro Bernini, the father of the famous Gian Lorenzo Bernini. For being the smallest country in the world, the Vatican holds the greatest collection of artistic and architectural treasures that are among the most famous in the world. The Vatican Museums boast masterpieces by Michaelangelo, Raphael, Leonardo da Vinci, Caravaggio, Giotto, Titian, and more. Inside the Vatican you have the opportunity to visit the Vatican Museums that’s vast labyrinth of opulent wall to ceiling artwork, galleries of paintings and countless classical to Renaissance era sculptures. At the far end you will be rewarded with arriving at the Sistine Chapel adorned with Michelangelo’s most famous frescoes on the ceiling, and the Last Judgment. Saint Peter’s Basilica is the largest church in Christendom and where the site of Saint Peter’s tomb is believed to be. Larger than life, inside the Renaissance Saint Peter’s Basilica you will awestruck by Michelangelo’s famous sculpture the “Pieta”, Bernini’s imposing bronze canopy above the alter, the splendid Cathedra Petri (the Throne of St Peter) and the ornate Chapel of the Sacrament. Thank you for visiting our travel blog and reading our See ROME IN A DAY from Civitavecchia article.